"The scope and complexity of an administrative position is one of the greatest challenges that an aspiring assistant principal faces. 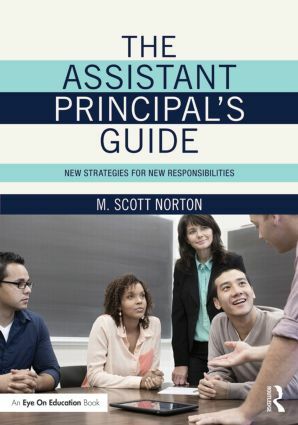 This book provides a foundational framework for all potential assistant principals… I would buy this book and use it as a reference for helping teachers transition to entry level administration, as well as use it in the university setting." "As the academic and social expectations of the principal change, the role of the assistant principal in regards to required knowledge, skills, and instructional leadership has changed… This book would be valuable in an Introduction to Leadership class, and I would recommend it to current and aspiring administrators." Chapter 1---The Assistant School Principal: Bringing This Leadership Position to Life! Dr. M. Scott Norton is a former public school teacher, coordinator of curriculum, assistant superintendent, and superintendent of schools. He has served as professor and vice-chair of the Department of Educational Administration at the University of Nebraska at Lincoln and as professor and chair of the Department of Educational Administration at Arizona State University where he is currently professor emeritus.